A covert organisation watches over aliens living on Earth. Imagine that there are aliens. Now imagine that there are aliens who are not only living among us, but are being monitored by an ultra-secret secret organisation known only as the Men In Black. That simple premise, which has its roots in the paranoid folklore of UFO spotters, was the idea behind a cult comic book series created by Lowell Cunningham, and spawned one of Summer 1997’s most popular films. Men in Black stars Tommy Lee Jones as the deadly serious veteran agent and a wide-eyed Will Smith as his rookie partner. The film has a plot that’s pretty incidental to the transitory delights on offer: an alien cockroach-like creature lands on Earth and threatens to start an intergalactic war, and the Men In Black try to stop him. During the film the agents encounter a number of wild creatures and situations, enabling them to employ various ultra-cool gizmos and weapons. The film successfully creates an offbeat alternative reality where the outré elements seem believable, and manages to perfectly balance black comedy with heavy-duty science fiction action. The film boasts a large number of excellent special effects sequences, including digital animation by Industrial Light and Magic and elaborate creature effects by make-up master Rick Baker. Barry Sonnenfeld, whose quirky humour is evident in the two Addams Family movies and Get Shorty, directed the film. Fans of the film have had to wait impatiently for the film to be released on DVD. 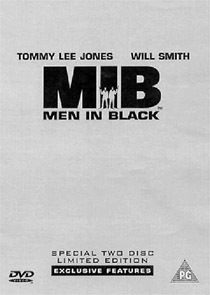 In 1997 Columbia Tristar announced that Men In Black would be one of the first “killer” titles that would spearhead the launch of the format. When it failed to appear rumours abounded that tens of thousands of copies sat ready in warehouses, and that Steven Spielberg (the film’s Executive Producer) was vetoing their release. Almost three years later the film was released, and it was certainly worth the wait. There are two UK DVD versions available, a standard edition and a two-disc Limited Edition version, reviewed here, that contains all the supplements on the standard edition, and adds an exhaustive array of extra material that will certainly satiate all but the most devoted fans. The film’s transfer looks terrific, with a very detailed image, with strong colours that dramatically improve on the THX-certified NTSC laserdisc version. The widescreen version is presented in the original 1.85:1 theatrical ratio, enhanced for 16:9 equipped sets. There’s a little grain here and there, and the occasional speck of dirt. Encoding artefacts are virtually absent, but there is some evidence of edge enhancement in some shots. The Dolby Digital 5.1 sound mix is thrilling, with numerous demonstration-quality sequences and separation effects that are likely to raise a smile or two. Columbia has really outdone themselves with the disc’s elaborate animated menus, too, which maintain the atmosphere of the film. The supplementary materials combine effectively to convey the development process, detailing the enormously creative input of almost every performer and crewmember. It soon becomes obvious that many of the film’s most memorable sequences, gags and images didn’t originate in Ed Solomon’s robust screenplay. The supplements include: three sequences comparing the storyboards to the finished film; complete storyboards for the encounter wth Jeebs and the final CGI sequence; the terrific Will Smith music video, featuring Mikey; detailed examinations of the various aliens, from original design to finished creature; trailers (including a teaser for MiB 2 that gives nothing away); and more than a thousand photo’s and pieces of production art. A contemporary six-minute promotional featurette is also included. Five extended or deleted scenes are presented, but these are relatively disappointing, since none add anything to the plot, feature unseen creatures, or add character development. These are taken from an early work print, with incomplete sound mixes. They also lack special effects enhancement (one is the bouncing ball sequence, without the ball). One of the key features of the two-disc version is the “scene editing workshop”, which allows the viewer to assemble a scene from three different angles, and compare the results to the version that ended up in the film. It’s a fun feature, if rather gimmicky, and one that has little lasting appeal. Three scenes can be manipulated in this way. A couple of scenes, including the morphing car sequence are dissected using the multi-angle feature to present them in various stages of production. An outstanding new twenty-five minute retrospective behind-the-scenes documentary, Metamorphosis of Men in Black, details the changes made from concept to finished film. The plot and tone of the film changed quite radically during shooting. The documentary demonstrates how Sonnenfeld managed to manipulate existing footage to fit what one of the contributors calls the “eventual plot”! This includes a couple of key scenes, which are presented in their original versions, showing how the plot was fine tuned during the post-production process. It also features several tantalising shots of Rick Baker’s original Edgar bug creature, which was replaced at the last minute by an elaborate CGI sequence that added four million dollars to the film’s budget. The documentary also all too briefly showcases the contributions of the film’s peerless designer, Bo Welch. The disc features two compelling commentary tracks, both especially recorded for the DVD. The first, by Sonnenfeld and Tommy Lee Jones, is chatty and anecdotal. It’s augmented by on-screen silhouettes of the two contributors (similar to those used on Columbia’s equally impressive Ghostbusters disc) and Match of the Day-style magic pen effects, which Sonnenfeld uses to draw attention to things on screen, even when they’re not mentioned in passing. Sonnenfeld’s solo commentary for the NTSC laserdisc version, which was more formal, has been cannibalised for the second track, which also features input from Rick Baker and key members of the special effects teams. Columbia’s decision to offer the option of a full-screen presentation only on the two-disc set is most curious, and highly questionable. This would have been an appropriate alternative for the standard edition, the one aimed at Joe Public, but no serious fan of the film will be interested in seeing anything other than the proper widescreen version. The full-screen version hops between an open-matte presentation (revealing more picture top and bottom, but spoiling the composition) and pan-and-scan (losing picture information at the sides during almost every effects sequence). This wastes disc space that could have been utilised for another commentary track, more supplements or, better still, the DTS soundtrack that’s only available on an alternate, single-disc Region 1 variant (which lacks the Limited Edition disc’s extra features). In order to keep its theatrical PG certificate the film has been altered at the behest of the BBFC: there are two instances in the film where the work “jerk” has been substituted for “prick”. Other differences between the UK and US discs appear to be minor. Trailers for Bad Boys, Ghostbusters, The Mark of Zorro and Starship Troopers (a Buena Vista title in the UK) are missing, replaced by one for Stuart Little.